Travel east on Rt 44, continue east 3.3 miles past the blinking light in Lakeville CT (through the center of Salisbury and past the Salisbury Garden Center on your right). At the next blinking yellow light, turn LEFT on Taconic Rd. Travel 2.7 miles, then turn RIGHT onto Twin Lakes Rd, and continue 1.5 miles. At the Institute for World Affairs (on the left), turn right, staying on Twin Lakes Rd. Continue .6 mile to the church, which is on your left. Park on the street or on the back lawn, weather permitting. Take Rt 44 west, traveling through Canaan, CT. Approximately .3 mile past the intersection of Rt 44 and Rt 126, bear RIGHT onto Twin Lakes Rd. Travel 1 mile and bear LEFT at the “Y” staying on Twin Lakes Rd. Travel 1.8 mile, and the church will be on the right. Park on the street or in the back lawn, weather permitting. Take Rt 8 north to Winsted where the highway ends, Turn Right onto Rt 44 west, and follow directions “From points east of Salisbury, CT”. 9:45 AM Hours; 10:00 AM Divine Liturgy (9:30 from June 1—August 31) followed by Coffee Hour. For a complete list of upcoming services, please visit the Monthly Calendar on the parish website. In December 1989, a service of Thanksgiving (Molieben) was celebrated at St John’s Episcopal Church, Lakeville, CT by Fr John Pawelchak. In attendance were VRev Nicholas Timpko (Dean), Rev Charles Bevin (pastor o, St John’s)m Liza Fowler, John, Evelyn, and Julianna (age, 4 months) Kreta, Hope and John Mongeau, and Paul Leka. The beginning of our missionary outreach to the northwest corner of Connecticut was initiated by His Grace, Bishop Job of New England, OCA, Fr Timpko, and Fr Michael Koblosh. Through the generosity of one of the newly formed group, we met in the Great Hall of the Colgate Mansion (home of Paul Leka) for Monthly Divine Liturgy from January to May 1990. All services were celebrated by Fr John Pawelchak, our Priest-in-Charge. From the beginning of our mission outreach, we were blessed with the dedicated and attentive Reader and Acolyte, John Kreta, and a competent and devoted choir director, Evelyn Kreta. Within just a few weeks, John Maichack of Terryville, CT expressed a remarkable faith in the future of the mission by donating a mosaic Icon of the Holy Face. Paul Leka purchased over 100 paper icons of all the Saints, and worked diligently to mount each one on wood for use at the mission. Everyone in our worshipping community cooperated to initiate as full and a beautiful liturgical cycle as possible. During the next two years, we were truly blessed to intermittently share two churches belonging to the United Church of Christ (Congregational) in Cornwall, CT. The people of the Cornwall’s worshipping community graciously encouraged us as we grew spiritually and liturgically. Pentecost, our first service in Cornwall, was celebrated on June 3, 1990 at the United Church of Christ, North Cornwall Meeting House on Towne St. David Barrett directed this service and graciously assembled the music for the Divine Liturgy. The parish grew to approximately 14 people and services increased to bi-weekly. On the Feast of All Saints of America on June 17, Archpriest Peter Kreta of Kodiak, AK celebrated Divine Liturgy at the United Church of Christ (Congregational) in Cornwall Village. He provided us with the Troparion to All Saints of America which was to become the Troparion of our church. Vespers were celebrated later that day by His Grace, Bishop Job, Fr Michael Westerberg (Dean), Fr John Pawelchak and Fr Peter Kreta. At the fellowship meal which followed Bishop Job officially recognized us as a mission and asked us to submit three possible names for our newly established parish. Hiermonk William (Saulnier) was appointed Priest-in-Charge beginning in July. The Gospel Book used at all of our services was donated by Fr William. He is especially remembered for his liturgical sincerity, spiritual perception and excellent cooking, especially for his bread and baked beans. Devoted parishioners volunteered to serve on the first church council, which was chaired by John Kreta who held this office until his ordination on March 20, 1994. In late 1990, we accepted Paul Leka’s offer to resume holding services in his home. Fr John Pawelchak was again assigned Priest-in-Charge in February. We began weekly celebration of the Divine Liturgy. John Kreta led a Reader’s Vespers Service on Saturdays when Fr John was unavailable. Additional services were celebrated on major Feast days and during Great Lent. Our first Pascha was joyfully celebrated with 32 people. A community agape meal followed. June marked the first anniversary of our mission. Bishop Job was the main celebrant at the Divine Liturgy on the Feast of All Saints. Also serving were Fr John Pawelchak, Fr Michael Koblosh, and Archdeacon Roman (Skvarnavicius). Sixty people atttended the service which was followed by a memorable picnic on the mansion grounds. In August, an Icon mounting workshop led by Vladimir Aleandro and a retreat led by Bishop Job enriched our spiritual growth. The encouragement, guidance, and direction we receive from the New England Diocese is especially noteworthy, as is their financial support of a $200 monthly subsidy. In February of 1992, the mission resumed holding services in the North Cornwall Meeting House during the winter, and in their Cornwall Village Church in the summer. The first Baptism in our mission, the infant Joseph JT Kreta, took place in March. Also, we celebrated the first conversion and marriage with Gavin and Vanessa Egerton. Bishop Job visited on our feastday, which was followed by a luncheon at the American Legion Hall in Sharon, CT.
Much effort was put into finding a permanent location for the mission and many options were explored. This led us to formalize our budget and to implement stewardship/pledging. In December the Council voted to recommend the purchase of the St Francis Catholic summer chapel located on Twin Lakes Rd in Salisbury, CT.
At the annual meeting the church community voted to purchase the St Francis chapel. Negotiations began and it took many months to finalize all of the terms. Pascha: We were blessed with the visitation of 60 children from Ukraine and over 30 adult chaperones and sponsors. These children helped create a joyous Pascha, their first in America. June: In anticipation of our pending purchase, we leased the St Francis Chapel and celebrated our first Divine Liturgy there on our Feast Day. The church real estate closing took place on November 8, 1993, thanks to our attorney Mark Malley, among others. 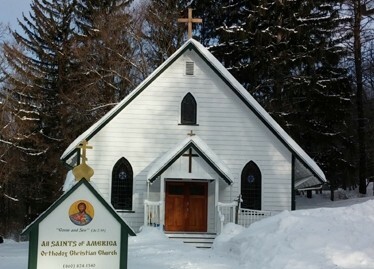 A heating system was installed, electrical systems were upgraded, ground maintenance progressed, and plans to physically transform this former Roman Catholic Chapel into an appropriate space for Orthodox worship were initiated with much care, joyous prayer and tireless efforts of the members of our small but growing parish. Thanksgiving: Participation in the Annual Inter-Faith Service in Salisbury, CT, a joint service of Thanksgiving with United Church of Christ—Congregational at the North Cornwall Meeting House. We planted a spruce tree behind the church in thanksgiving for the parish’s many years of kindness and support to our community. Fr Andrew Tregubov, an Iconographer and parish priest in Claremont, NH visited us to discuss iconography for the Church. During his visit, we discovered that the mosaic Icon donated at the inception of the Mission was Fr Andrew’s work. By-laws were approved and adopted by majority vote at the annual parish meeting. In this year of the Bicentennial of Orthodox Christianity in North America (1794-1994), we also celebrated the blossoming in the grace of our Lord of our Church. On February 27, John Kreta was ordained to the Holy Diaconate by Metropolitan Theodosius at St George Albanian Orthodox Church in Trumbull, CT. This Diaconate Ordination and celebration was initiated and beautifully planned by VRev Sergei Bouteneff. After visiting several churches and after much discussion, our mission chose Fr Andrew Tregubov to write the first two Icons for our Iconostasis. The entire church community spent 2 days painting the interior of the church. Fr Deacon John Kreta, John Mongeau and John G Mongeau Jr spent many evenings and weekend hours recreating the altar space, including the building of an ambo. The altar area was then carpeted through the donation of Mr Paul Leka. Hope Mongeau sewed purple altar coverings for the upcoming Lenten season. On Friday, March 18, the first two icons, framed in cherry panels, arrived via transport by two members, Molly White and Dan Marshall, invaluable supportive parishioners, helping whenever and wherever needed. The transformation of the interior of the church was truly accomplished with the installation of these icons, which by their beauty and mystery transfigured everything in their presence. The church building began to appear as a temple of the Body of Christ, a place where the Kingdom of God is experienced in the Divine Services and prayer. The Sunday of Orthodoxy on March 20 was the manifestation of two extraordinary events. The first event was the ordination to the Holy Priesthood of Father John J Kreta by His Beatitude, Metropolitan Theodosius. We also experienced the joy of the presence of Protopresbyter Joseph Kreta and Matushka Marie, Archpriest Peter Kreta and Matushka Marilyn, who energetically directed the choir, and many Kreta and Leka family members and friends. A lenten meal at the Interlaken Inn, Lakeville, CT followed the Divine Liturgy and Ordination. Everyone worked hard to make the Ordination and subsequent events a true success. The second event of the very same day was the celebration of the Vespers of the Sunday of Orthodoxy by His Beatitude, Metropolitan Theodosius and clergy from the Connecticut Deanery. A very strong deeling of unity of the church persisted throughout the day, with everyone sening the love and presence of Christ in our worship and in each other. We were blessed to have two priests during our first Great Lent and Holy Pascha in our new home. The Church community girded its loins and went to work in anticipation of the Consecration of our Church on June 26 by His Beatitude, Metropolitan Theodosius. With each task begun in prayer, exterior renovations began, including landcaping and painting and the installation of a new sign prominently introducing our church to the community. The interior floors of the church were sanded and the original beauty of the oak floors was restored. The Royal Doors and Icon, with reliquary, of St Herman of Alaska, from the hands of Iconographer Fr Andrew Tregubov, carver Timothy Tregubov, and carpenter Stanley Dole were commissioned for the consecration. Throughout the relatively short life of this growing mission, many additional individuals helped our work: Matushka Kiryluk donated many liturgical items (including chalice, paten, star, spear and spoon, Winding Sheet, and chairs) of her late husband, Fr Nicholas Kiryluk. May his memory be eternal. Nadia Yovanovitch skillfully made Altar coverings for the different seasons. Fr John & Prifteresha Evelyn Kreta and Julianna & Joseph, you’ve been there through everything. The Holy Spirit built the church and its choir through your constant efforts and sacrifice. Matt Malley contributed his carpentry skills and good humor. Tania Bouteneff lovingly and capably designed and hand-embroidered the two processional banners. the Beautification Committee, John Mongeau & Nicholas Rondinone, for organizing and laboring for numerous work parties, which included tree trimming, root excavation, painting, carpentry, and battling the wildlife. John Jr & David Mongeau for the provision of many forms of labor that required young, strong men—pew removal, lawn mowing, peak-painting, and dump runs. Nicholas & Florence Rodinone and John & Nina Dubnansky were the catalysts and providers of the floor sanding and re-finishing. John & Helen Pshenishny for so many months of opening, closing, and cleaning the church, and coffee hour donations and preparations; if there is anything the church or one of us needed you found it! Paul Leka built and donated the Altar, tetrapods, and 7-foot gold-leaf three bar cross, as well as the beautiful mauve carpet for the Altar area, installed in 1994. He continues to provide storage for extra pews. Vanessa & Gavin Egerton donated a computer system for the mission’s use. Church council members, especially Hope Mongeau & Nadia Yovanovitch for their expert transcription of the minutes of our amazingly long meetings; and to Renee Pike for creating organization out of chaos, competently managing our finances, paying bills, counting collections, bookkeeping, and all that goes with being our treasurer—and for filling in when needed. Anna & Mary Kavula and George & Susan Konomos for their constant participation in our fundraising activities, especially our bake sales! Molly White for singing, baking, cleaning, and most of all, for praying for us. We thankfully rejoice in the many ways you continue to lighten our hearts and our work. It is most fitting that in these years that God has bestowed on us such bountiful gifts, the greatest of whom is you, our Orthodox brothers and sisters, friends, families and Northwestern CT community merchantts who join us in continuing God’s work in the missionary spirit.